Are you craving pizza but trying to find a healthier option? Try this super simple, (and fast!) thin crust pizza, using sprouted grain tortillas and whatever toppings you like! This simple pizza recipe is also a great way to get kids helping in the kitchen. Preheat the oven to 400 degrees. Line a baking sheet with parchment paper, and place the first tortilla on the baking sheet. Cover with 2 tablespoons of pesto, tomato sauce, or shredded cheese. Place the other tortilla on top, and cover with another 2 tablespoons of pesto, tomato sauce, or shredded cheese (mix and match between layers, if you want!). 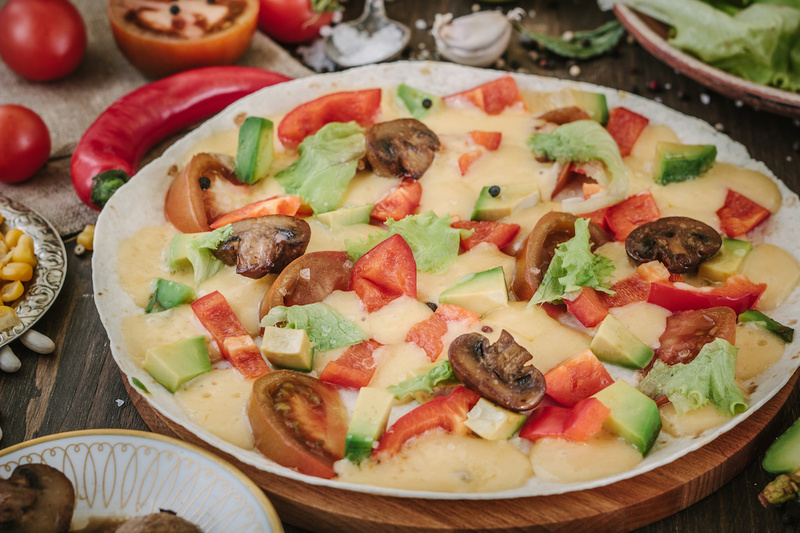 Finish with a sprinkle of your favorite toppings, place into the oven, and bake for 8 to 10 minutes, or until the cheese is bubbly and the tortillas are crisp.